Here is the list of best free furniture design software for Windows to design models of furniture of any shape or size. The free woodworking software provided in the list are easy to use and understand. These free furniture design software come with a library of objects from which you can choose shelves, doors, drawers, etc. and add them to your design. You can design a model of a furniture in 2 Dimensional mode and view it in 3 Dimensional mode instantly. Also, you can change the viewing angle in 2D mode while designing furniture. View the dimensions of objects while designing them using the measurement tools that these furniture design freeware provide. Directional viewing modes are also provided in these software, which make the designing process easy. Once a furniture is designed, you can save it in these software’s native formats or print them. The furniture making software that I liked the most is Polyboard. This is because of the features that it offers. It comes with a library of different objects from which you can choose: shelves, doors, drawers, walls, floors, and various parts to design furniture. This free furniture designer software also lets you work with multiple furniture at a time in different windows. It also has a list of Cabinets that you can use as a base to create your own cabinet design. Moreover, it supports more than 10 languages. You can also check out the list of best free Interior Design Software for Windows, JP2 Viewer Software For Windows, and SketchUp Viewer For Windows. 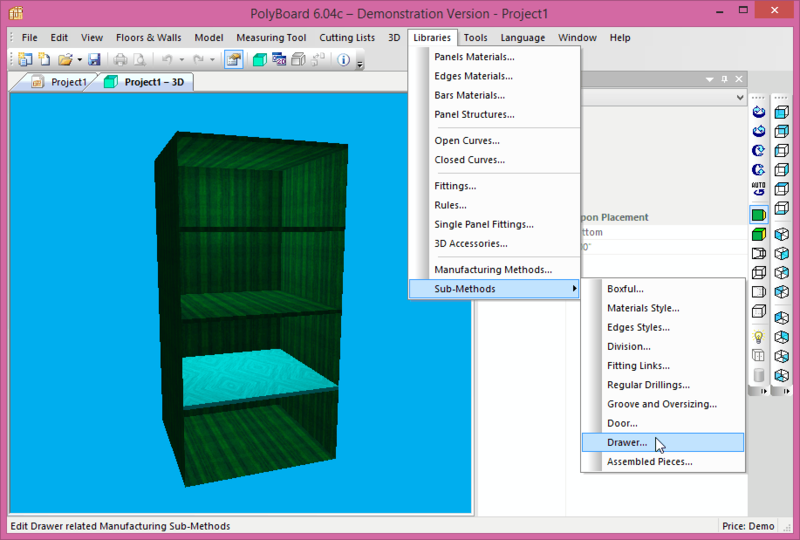 Check out PolyBoard, a free furniture design software for Windows. Using this software, you can design furniture of your own choice in some simple steps. PolyBoard lets you choose from a library of shelves, doors, drawers, walls, floors, and other objects to use as a base to begin designing. You can also begin designing a furniture from scratch. An interesting feature of this software is that you can design more than one furniture at a time in multiple windows. This lets you easily work with multiple furniture designs at a time. Do note that this is a free version of PolyBoard and some of the features of the paid version are not available. If you want to use all its features, you have to purchase its full version from its official website. Let’s see how to design a cabinet using this furniture design freeware: Start designing your cabinet by drawing rectangular or square shapes. That will be the base of your furniture. After that, you can construct its walls at its borders and place shells, doors, drawers into your design. There is a huge library of furniture objects from which you can choose the pieces. Grid lines are available in the workspace which make the furniture designing process easy and accurate. PolyBoard also features directional views so that you can visualize your design in all directions. These directional views are available in 2 Dimensional modes. Some of these modes are Top Down SE View, Top Down NW View, Top Down SW View, Bottom Up SE View, etc. You can edit each part of a furniture separately by selecting that particular part. One more interesting feature of the software is that it comes with an Auto-rotation mode which rotates your design automatically. When you are done with your design, you can save it as a Project or as a 3DS file. Do note that the software does not give an option to print models; only option is to take screenshot. However, the software blocks Print Screen key as well, so you will need to use some screenshot software that lets you change screenshot hotkey to something else (I tried ShareX, and it worked well for me). You can adjust viewing angle in 2 Dimensional mode. This furniture design software comes with a library of doors, drawers, and other parts to design furniture. It lets you add different textures to different parts of furniture. You can adjust transparency and brightness of each part of a furniture. You can also change background color in 3D view. Note: This software supports more than 10 languages, such as: Dutch, Spanish, French, Italian, Portuguese, Roman, Hebrew, Chinese, etc. Mobi3D is a free furniture design software for Windows which lets you design a model of a furniture. This software offers a user-friendly interface that makes it easy to use and understand. It shows four different types of views simultaneously, you can adjust them as per your convenience. 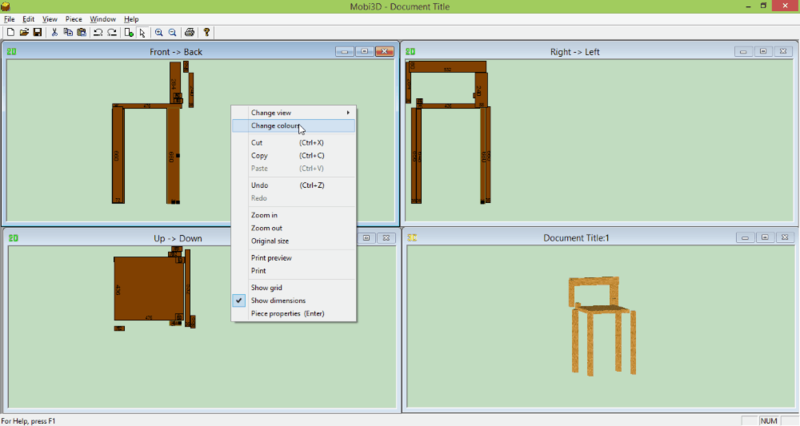 Design a model of your furniture in 2D mode and visualize it in 3D mode simultaneously. The dimensions of each block are shown inside it. You can change color, texture, and dimensions of a particular block of furniture. Do note that this is a free version of Mobi3D and has some limitations. You can design a furniture with a maximum of 10 parts. If you are going to design a furniture that requires more than 10 parts, you have to purchase its full version from its official website. Start designing your furniture by drawing blocks one by one with the help of Draw tool. The software shows four types of views simultaneously, namely, Front>Back, Right>Left, Up>Down, and 3D view. You can design in any of the 2 Dimensional views. It shows you a 3D rendering of the designed furniture with respect to the 2D design you create. Navigate your design in 3D mode so that you can place each block accurately in 2D mode. If you want to change color, texture, and dimensions of a particular block, choose the select tool from the toolbar and double click on that particular block. This will open a window in front of you in which you can modify that block. Zoom tool lets you zoom in or out of the screen anytime. If you have accidentally created a block in your design and want to remove it, click on Undo button provided in the toolbar or you can simply press Ctrl+Z button on a keyboard. Moreover, if you have accidentally removed a block from your design by clicking on Undo button, click on Redo button provided in the toolbar. When you are done, you can save your design in M3D format or take a print out of your design. This can be done by clicking on the print button provided in the toolbar or simply by pressing Ctrl+P button on a keyboard. You cannot export your model as an image here. Design your furniture simply by dragging the mouse pointer on the screen. You can zoom in or out of the screen any time. You can print any view of your design. You can change the dimensions of a particular block according to your design. You can also change the color of your designed furniture, border color of a particular block, background color in 3D view, and grid color.